Minimal Map demonstrates how to use the Map item to render a map. It shows the minimum amount of code needed to display the map, and can be used as a basis for further experimentation. In main.cpp we use only the QGuiApplication and QQmlApplicationEngine classes. In the main function, we first instantiate a QGuiApplication object. Then we create a QQmlApplicationEngine and tell it to load main.qml from the Qt Resource System. Finally, QGuiApplication::exec() launches the main event loop. In main.qml, we import the QtLocation QML module and its depending QtPositioning QML module. Next, we create the top level window, set a sensible default size, and make it visible. The window will be filled by a Map item showing the map. The Plugin item is necessary to define the map provider we are going to use. The example can work with any of the available geo services plugins. However, some plugins may require additional plugin parameters in order to function correctly and we can use PluginParameter to specify them. 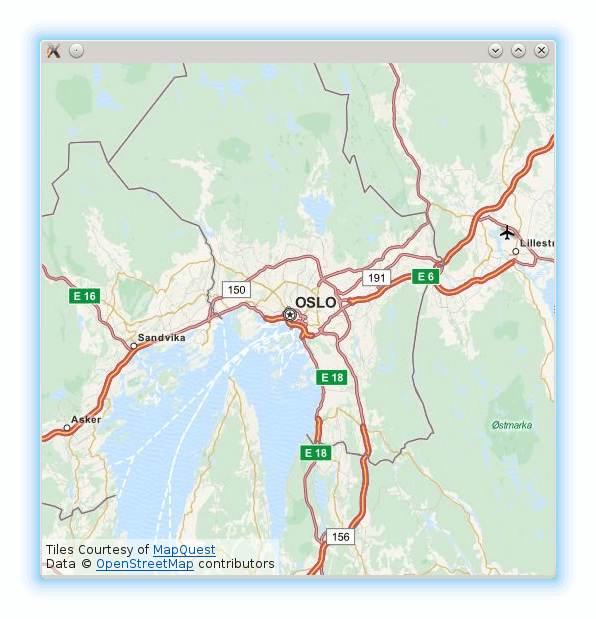 In this example, we use the osm plugin, which is a Qt Location Open Street Map Plugin and does not require any parameters. In the Map item, we refer to the plugin we use and we set the center and the zoomLevel of the map. The example requires a working internet connection to download OpenStreetMap map tiles. An optional system proxy should be picked up automatically.